We have so many dreams and plans in mind which we want to achieve in our life. But we manage to full fill only few among them. Buying a car is one such dream which these days are no more a luxury but a need of life. If you are having your own car with you we are sure that you will be looking forward to take the best care and do timely maintenance service for it. But what are those influential factors which can destroy the car paint? 1. The damage of the sun's ultraviolet rays: The harsh ultraviolet rays of the sun are responsible towards causing damage to the surface of the car. You will notice faded spots of color on the car surface making it look dull and unimpressive if you park your car under the sun for a long time. Therefore, it is best to find shade for your car to get away from the hot sunshine. 2. Brake dust: Hot brake dust which comes out from your car brake or even from the brake of other drivers land on the surface of the car paint and melt right into the car surface. If timely cleaning is not done then that will start damaging not only the paint but also the surface of the car badly. Use of car paint protection film will help to keep the car surface safe from the falling brake dust on the surface especially in the case when it is parked outside. 3. Highway asphalt: Especially during the summer months the highly asphalts are prone to melting because of high temperature. This makes them real sticky. When you drive your car these sticky elements make their way somehow to reach the car paint. Even when you park your car by the side of highway other cars passing by also spreads the sticky asphalt on the surface and cause damage to the paint of the car. 4. Insects and bird droppings: The problem of bird droppings are common to see all over the world. So if we are not careful towards the protection of our car bird droppings can cause serious problem to it also. Excess acidity of the bird droppings starts degrading the paint quality. If immediate cleaning is not done the heat of the sun will start baking them on the surface and make it seat hard on the surface. Bird droppings are a perfect blend of urine and feces. Once it gets hard and you forcefully remove it you end up causing scratch and damage to the paint. 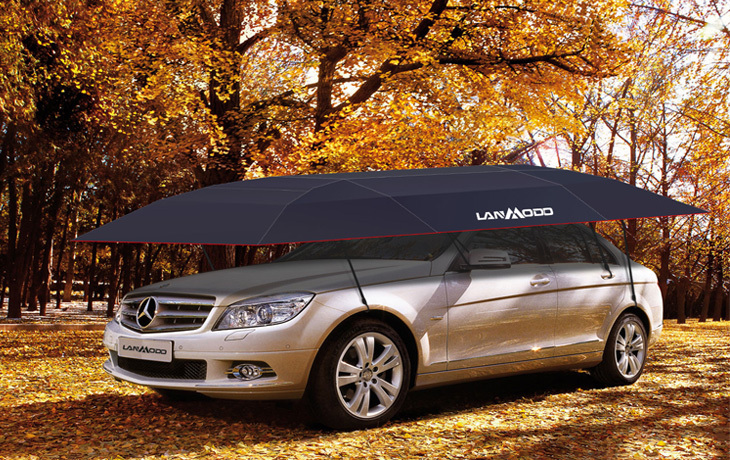 Go for an outdoor car cover like Lanmodo car protection cover to protect your car from the harsh effects of the bird falling anytime and anywhere when you park your car outside. 5. Acid rain: The name acid rain is sufficient enough to let us know how damaging it is not only for the cars but also for human beings. The acidity present in the water is enough to cause damage to paint and weaken the metal of the car surface. With time you may notice breakage of the surface. Timely cleaning of the acid water if not done it will create excessive damage to car. Use of waterproof car cover can protect the car from rain water, which is one of the must car paint protection to keep the car safe. 6. High temperature: When your car remains exposed to sunlight constantly it falls prey to temperature fluctuation. The paint will expand and contract with change in temperature. With time it will start developing crack on the paint surface and make opening which will show path for infiltration of moisture, chemicals as well as salt. This will again show route to occurrence of rust and serious damage to the car. Protect your car with car canopy to stay safe from such damages. 7. Falling leaves: When you park your car under a tree you face the problem of falling leaves. If not removed on time it will start secreting acid from the leaves and that will damage the surface of the car paint. Either park it away from tree shed or use Lanmodo car canopy to avoid the issue. 8. Falling objects and scratch: Especially in the rainy months hails cause serious damage to the car paint. Even falling objects are responsible to cause critical scratch on car surface. A strong car canopy is best for car protection to stay safe from such damages. 9. "Disfigurement" of ordinary car washing: With the intention to save bucks needed for professional car washing we end up getting it done on our own. But being a non professional in this field we actually don't know how to clean it correctly. Our ordinary car washing technique actually leads to causing damage to the surface of the car. If we keep the car well protected always using a good quality car canopy then an occasional professional cleaning or water wash will be enough to keep the paint and car surface clean. There are different ways in which you can keep car paint well. You can coat it with car paint protection film, you can also buy a car cover like Lanmodo car protection cover to protect it.